>FCC me, passenger power really works! I never did have a very high opinion of First Capital Connection (FCC), the train company that recently took over the Brighton – Luton line franchise that stops also at Kings Cross Thameslink station, a short (if grotty) walk down the Euston road away from SSEES. When they took over they wasted no time in repainting and re-uphoslstering the old Thameslink trains (now pink and blue instead of blue and yellow) and putting out leaflets and billboards saying that megabucks would be spent improving the service. Little changed, however, apart from an eyewatering 40% increase in offpeak ticket prices on 1 January 2007 (allegedly dictated by the Ministry of Transport). When its stopping services are running late, however, FCC’s most anti-social habit is to decant passengers at Haywards Heath to wait for a later train and run the train straight to Brighton. When they tried this yesterday, however, on the 20.50 service (Driver’s tannoy annoucement: ‘I have just been handed a note saying…. ), a mini-rebellion took place on the platform of Haywards Heath station as 20-30 angry commuters realised that there train was now virtually empty and started haranging a hapless station employee (not employeed by FCC, but probably the track company ) demanding the phone number of the FCC despatchers, customers services, managers etc so they could give them a piece of their mind. He could only offer an FCC Claim for Compensation Leaflet (you get 50% back if the arrive more than 30 mins. after scheduled arrival and protest that “This happens all the time, they’re always doing this. However they keep their franchise, I don’t know….” Neither did we. 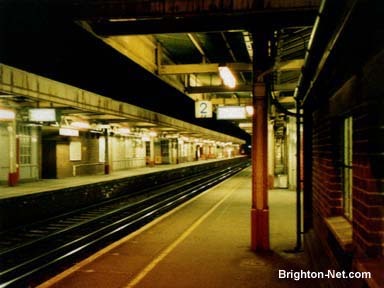 Retreating into his room, he must, however, have got on the blower to the FCC control room, as 5 mins later it was hastily announced that the train would, after all, be stopping at all stations to Brighton after all. Protest and survive – or at least don’t wait an extra 20 mins on a cold station platform. I guess, as ever, there’s a PhD topic waiting for someone: “Contention and Compliance in the Behaviour of UK Rail Passengers: An Ethnographical Study”…? “(…) Although the Czech lands had perhaps the strongest social democratic traditions in Central and Eastern Europe, in Václav Klaus’s Civic Democratic Party (ODS), they gave rise to the region’s strongest and most stable free market party. As many observers quickly noted ‘Thatcherism Czech-style’ was more Thatcherite in rhetoric than reality. Under Klaus the Czech state retained an enduring (if weakly exercised) control of both markets and economic assets and privatized in a way which was both bureaucratic (and hence vulnerable to corruption) but also overly reliant on the voucher method of privatization, which empowered fund- and enterprise managers at the expense of small shareholders. As the already rich literature on Czech economic transformation has shown, the unintended consequences of mass voucher privatization combined with the Czech right’s aversion to regulation and penchant for doomed and dubious buyouts by would-be Czech captains of industry led to economic underperformance and corruption. The early political dominance of the Czech right also rapidly unravelled as the Czech centre-left gradually reasserted itself. Only deep splits between the Czech Social Democrats and the hardline, unreconstructed Communists prevented Scandinavian style marginalization of the liberal right. Instead in the decade since 1996 the Czech Republic experienced ever more refined forms of political stalemate: minority coalitions, caretaker governments, precarious parliamentary majorities and numerous types of ad hoc left-right co-operation. Many expected the June 2006 elections, which took place as I was finishing book the manuscript, to break this pattern. Faced with disunited and scandal-hit Social Democrat-led coalition, the right seem set to sweep back into office with the Civic Democrats promising a radical programme of tax and welfare reforms. However, their apparent triumph at the polls in June – which saw the party receive its highest ever share of the vote – was a distinctly Pyrrhic victory. Even in unlikely new alliance with the Greens, the parliamentary arithmetic left the party unable yet again form a majority centre-right administration. Ignoring President Klaus’s injunction to form a Grand Coalition with the outgoing Social Democrats, the Civic Democrats squeaked into office this January this year in a minority coalition government with Christian Democrats and Greens, helped out at the crucial moment by the abstention of two dissident Social Democrat MPs in a parliamentary vote of confidence. Much academic writing on the Czech right has been characterized by a fascination with the personality of Václav Klaus and a concern to engage critically with neo-liberalism. Some discussions centred almost to exclusion of all else on the personality and career of Klaus, stressing the former Prime Minister and current President’s charisma and ‘political skill’ as key factor in steering Czech transformation. Others conjured up hyperbolic condemnations of Klaus as a ‘Lenin for the bourgeoisie’ leading a ‘vanguardist party’ or showed more subtle biases in, for example, a sometimes uncritical reliance on Klaus’s former political opponents as sources of authoritative information and interpretation. However, depictions of Czech politics as ‘Havel vs. Klaus’ Clash of the Titans often unconsciously echo the right’s propagandistic depiction of Klaus as a political superman who single-handedly shaped Czech transformation. Similarly, critical debunkings of the pseudo-Hayekian policies and ideology of the Czech right tend to overlook its ambiguity, complexity and inherent interest as a phenomenon in comparative politics. Without offering an apologia for the failings of the Czech right, my new book, The New Right in the New Europe: Right-Wing Politics and Czech Transformation, 1989-2006 (RoutledgeCurzon July 2007) seeks to offer a mild corrective to both trends. It places the post-1989 Czech right in historical and social context by tracing it origins to the reactions of dissidents and technocrats to the collapse of reform communism after the 1968 Soviet-led invasion of Czechoslovakia and their responses to imperatives of market reform and decommunization both before and after 1989. Subsequent chapters consider the emergence of ­right-­wing forces in the disintegrating Civic Forum movement in 1990-1, the foundation of the Civic Democratic Party and the right’s period in office under Klaus in 1992–97. It then explores the subsequent divisions and decline of the 1997-2006 period when elite-grassroots tensions and uncertainties as to whether the right should be a vehicle for middle class development, further market reform or Hungarian style national populism put party unity under increasing strain even after the departure of Klaus as leader in 2002. The book concludes with assessment of ideology of the Czech Right and its growing (but evolving) euroscepticism. Ultimately, it concludes the Czech right created by Klaus and his co-thinkers can plausibly lay claim to be a new force in Czech politics, breaking with many previous patterns, but like its distant ancestors a century earlier is perhaps as national-liberal rather than neo-liberal. The New Right in the New Europe also seeks to use the Czech case to reflect more broadly on the nature of centre right forces across Central and Eastern Europe. The importance of ­the centre-­right in the region has often been overshadowed in both media coverage and academic research by preoccupations with extreme nationalism, sinister populism and the afterlife of former ruling parties. This April, Aleks Szczerbiak, Tim Haughton and Brigid Fowler (both University of Birmingham) published an SEI working paper which took the Cinderella topic of of the CEE centre-right a step further by for the first time systematically comparing the fortunes of right-wing formations in Hungary, Poland and the Czech Republic. In many ways, however, our research has raised as many questions as it has answered. The role of informal elite networks in sustaining parties which we highlight runs against the grain of earlier analysis of party systems in East Central Europe, which has seen them as essentially ideologically based and at bottom understandable in terms of formal models of party organization. The consequences of patterns of right-wing party development in post-communist Europe also need to be unpacked. The electoral growth but political failure of parties with flat tax platform such as the Czech Civic Democrats or Poland’s Civic Platform, for example, suggests that fluid, fragmented party politics along Slovak or Estonia lines offers the best prospect (or, depending on your point of view, greatest threat of) of further a wave of radical market reform in the region. Although a member of the UK Political Studies Association, I rarely attend its annual conference (in Bath this year on 11-13 April) which I find just too big, too expensive and too far off my research interests to go to. Beyond a paper of Russia and a couple on Czech party politics by authors whose work I already know, there seems pretty much zilch on post-communist politics bar some discussions of EU enlargement and Europeanization. The long running working-paper-in-the-making that I have co-written with Aleks Szczerbiak, Tim Haughton and Brigid Fowler on the comparative politics of the centre-right in Hungary, Poland and the Czech Republic gets an airing as a talk in at the SSEES European politics seminar series. Despite my hinting that this was not going to be rip roaring exposé of the far right quite a few SSEES students turn and there are some useful questions and comments. Can Poland’s Law and Justice (Pis) really be classified as centre-right given its homophobia, links with the Catholic ultras and non-membership of the EPP? I stress that, as far as I know, PiS’s estrangement from the European People’s Party and membership of the Alliance for a Europe of Nations (AEN) in the European Parliament is self-chosen and that Hungary’s Fidesz (safely ensconsed in the EPP) is in many ways more radical. PiS is also a broad catch-all grou, which was one of our criteria for defining the centre-right. But, says another questioner, this rather undermines your argument that the Polish centre-right is fragmented as it has two quite large (if antagonstic) parties: PiS and the liberal-conservative Civic Platform (mentioned before in this blog). This is again a good point, although the division of the Polish right into equal sized conservative and liberal-conservative blocs still represents a failure to (re-)create an overarching bloc and both – having been founded in 2001 – are fairly new formations. Did we see the parties as catch in an ideology vs. strategy vs. interests trilemma? Well, sort of, ideology building required political focus that distracts from campaigning (and vice versa) but for us ideology was a kind of organizational glue and solution to collective action probelm more than anything. More trenchant theoretical criticism comes from my SSEES colleague Felix Ciuta. As a security theorist of a constuctivist inclination, he doesn’t like my reservations about our emerging stress on ideology. It may be unmeasurable in many ways, but so (ultimately) are many things and my preferred stress on the cohesion of party founding elites is arguably an illustration of this. More seriously, he argues our whole analysis despite testing various theoretical explanations is very much geared towards various forms of elite action – the supply side, so to speak of party formation and we ignore (or just assume) electoral demand for centre-right parties of various stripes. This is a perceptive observation, although I felt that the different explanations we look at to explain centre-right party success (legacies and resources, electoral and constitutional incentives, path dependency and critical junctures) cast elites in slightly different roles. Moreover, Felix noted, my concluding remarks that studies (of the right) in CEE needed to be more aware of the role informal elite networks played in party formation and stabilization and less fixated with formal institutional models, was, from a Romanian perspective, bleedin’ obvious (my paraphrase, not his words). In Romania (and many post-Soviet points East) parties are self-evidently vehicles for elite networks. At the very least, ideology and elite cohesion should really be the starting point not the end point – I was quite sure whether to be pleased or despair at an invitation to write another on a 15,000 word paper, althought there was a certain iron logic to it. Our rather long and winding road through different explanations of centre-right party success (each wholly or partly ruled out I guess reflected the fact that we approached the topic from very much a Visegrad angle: successful reformers with fairly programmatic (and in Hungary and the Czech Republic) stable) party politics. But the discussion suggests, very interestingly, that in examining the politics in successful Visegrad states, we can learn from work done in relation to reform laggards such as Bulgaria or Romania on post-communist patronage and clientelism. There is I belief some work on clientlism, patronage and networking in relation to Baltic parties, which as I mentioned seem to be almost disposable institutions, but this (at least till now) has been little known among British specialists on wider Central and Eastern Europe. Coincidently enough, Herbert Kitschelt and Steven I Wilkinson have new edited book just out on, Patrons, Clients and Policies (Cambridge University). Being one of Professor K’s fans I naturally rushed out and bought it. It looks very good. Keeping one eye on the kids at the other end of the living room to check that fighting wasn’t about to break out again, I used the other to read a couple of chapters of by Steven D. Levitt and Stephen J. Dubner’s Freakonomics, picked up in a charity shop for 50p ages ago and fortuitously knocked off the bookshelf by my two year old in an earlier boisterous tussle over a teddy bear. 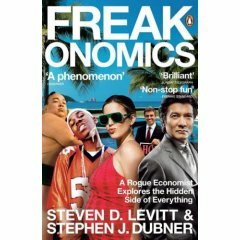 It’s written in an anodyne US news magazine style but the main originator of the book (Levitt) is a serious academic economist, who tries – no doubt deliberately courting controversy as well as indulging an offbeat intellectual curiosity – to apply economics based logics (of incentives) to everyday aspects microeconomic aspects of every day life and crime and criminality. So we get the not very enormous revelation that estate agents incentives are not perfectly aligned with those sellers (they seek achieve rapid series of sub-optimal sales not absolute price maximization in each individual sale) – something I along with several million other people had worked out already – but there are more interesting things. The organization and economics of illegal drugs gangs echoes those of conventional corporations with ‘senior management’ creaming off the big bucks associated with the bling-bling image of crack dealers, while ordinary foot soldiers earn a dangerous minimum wage and so have to live with their mothers. Spiralling US crime was cut off in 1990s not by zero tolerance policing or economic growth but (says Levitt) the delayed feed through of the legalization of abortion across the US after Wade vs. Roe case: low income, deprived single mothers tended to have more terminations than other groups thus preventing the birth of children statistically more likely to become the criminal superpredators of the future. Despite my scepticism (or was that jealousy?) of Levitt an over hyped bestselling pop-academic, I could help admiring some of the undoubted freewheeling iconoclasm. Was there I wondered some way of doing for political science what he had done for economics? At first sight, perhaps not. Economics as a discipline has more unified assumptions about rationality and incentives that political science/studies which embraces sub-disciplines as diverse as game theory and discourse analysis. On the other hand, part of the Levitt method is just to ask odd and iconoclastic questions based on quirks of daily life and some of approach (as far as I could work out from the superficial slickness of the Newsweek style prose) – such as the elimination of conventional explanations regarding the 1990s fall in crime – uses a straight comparative method based on the experience of different US cities. As various Amazon reviewers point out it’s not really economics, or at best ‘tabloid economics’. But could there, should there be a tabloid political science. Freak-o-politics anyone? choice framework from a Hayekian/Austrian School perspective – on the spread of (the idea) of flat taxation in Central and Eastern Europe using Ragin’s QCA method of comparision. The author Anthony J. Evans is British but did his thesis/postgrad in the US.